I am new to tenkara and new to fishing in Kansas, so between the two, I've been having slow (but improving) success this year. Last week, I went down to a popular local fishing spot in pursuit of white bass, or anything else that might bite. After an hour or two of fruitlessly twitch retrieving streamers and woolly buggers through riffles and pools, I was ready to give up. On my way out, I noticed one fisherman who was catching white bass with some regularity from a wall by casting preserved minnows across the fasted current and retrieving rapidly back across. This got me to thinking about how I could emulate this without elbowing in to his spot. I settled on moving upstream from the rapid, and then casting down and letting the streamer drift rapidly across. Almost immediately, I got a strong strike that broke the tippet! I realized that I had my rod pointed too far forward and had no cushion for the tippet. I was out of that kind of streamer, so I tied on a woolly bugger and cast again, this time being sure to keep the rod tip up a bit. After 2 or 3 drifts, I got another strike and the fish set the hook itself. 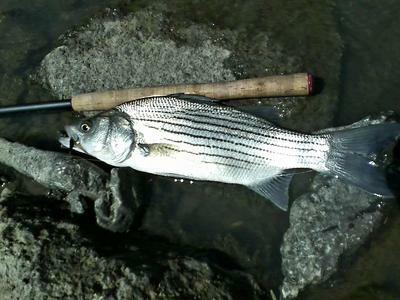 After a short fight, I landed a 13" white bass. Not terribly large, but the biggest fish I'd landed so far with tenkara. I'd already been out for a while, so I decided to call it a day. I came back the next day for some more action. I had tied more soft hackle streamers to be prepared. The water levels had changed enough since the previous day that it was much more wadable and the configuration of pools and rapids was different. The down and across approach failed at the spot where it had worked the day before, and also at other rapids. Eventually, I waded to the side of a large rapid where I had seen two young men catching fish, and decided to switch to rapidly retrieving across the current. On the second cast, I missed a strike, and on the 4th, I hooked into a good fish. This fish fought hard, and it's the first fish I've hooked where I felt the need to follow it (probably overly cautious, but I didn't want to push my luck). After about a minute of good strong runs, I managed to land a handsome 16" wiper. It's amazing to me how what works changes from day to day in the same spot. It really reinforces to me that the exact fly pattern is less important than the presentation and the general impression the fish gets. As I continue to learn tenkara skills, I'm enjoying gradually figuring out the limits of my tackle. Hopefully, I'll be able to keep pushing those limits upward! Great story. You are right on how the water can change from day to day. Remember, you never fish the same water twice! I lived in Manhattan many years ago, but wasn't fishing then. It looks like I need to make a trip back. I'm looking for a good white bass spot. We're you, by chance, out at the Rocky Ford area? I was at Rocky Ford. It's a popular spot with anglers of all stripes and can get pretty crowded, but you can usually find a spot to fish, and these fish don't spook easily. It's downstream of a flood control dam, so the conditions are very dependent on how much water they let out. It was at 200 CFS when I got these fish, but they're drawing down the reservoir at 15,000 CFS now. You can barely get down there, let alone wade, but I hear some people still fish when that much water is going through.